You may think that you can start a blog and immediately become successful. That isn't the case. Most bloggers spend years babying their blogs before they see any return. With that said, there are things you can do to make your blog the best it can be. 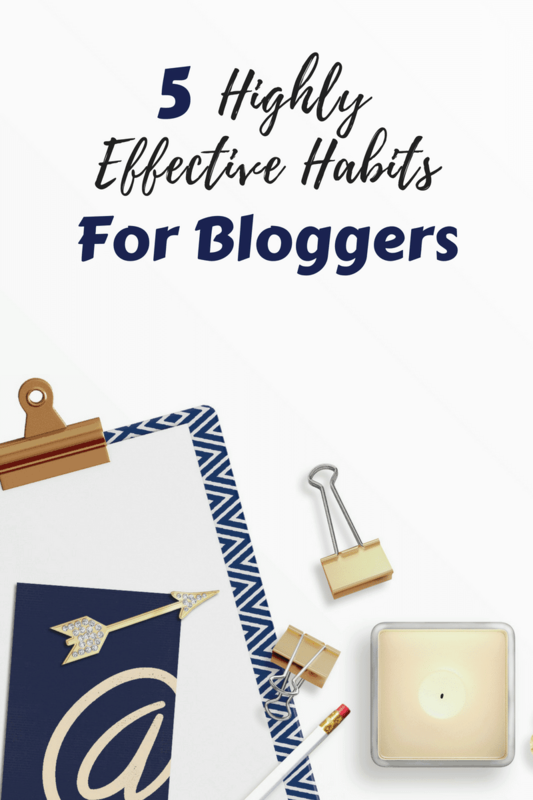 Let's take a closer look at five highly effective habits for bloggers. First things first. You want to be consistent. You want people to be able to count on your blog for new, exciting content. This means that if you put out a blog post every Wednesday, your readers are going to expect a new post every Wednesday. You never want to start a blog and blog each and every day and then just stop and only blog whenever the mood strikes. This is how many blogs fail. Another great habit you want to get into is to write content whenever the mood strikes. This allows you to build up a large collection of articles. When you do this, you'll never have to worry about writer's block. You'll always have content waiting to be published. When you do write several posts in one sitting, schedule those posts for later dates. Doing this allows you to always have new content being published. If you're writing evergreen content, you may find that you have posts scheduled for weeks or months into the future. It's not enough to simply slap up some content and call it a day. You want to take time to connect with those that leave comments on your posts. You also want to have social networks devoted to your blog. At the very least you should have a Facebook page for readers to connect with you. Adding an email address is another great way to stay connected with your followers. Last, but not least, successful bloggers have great graphics. You can use Canva, Photoshop, or PicMonkey to create great graphics for your blog. If you happen to also be into vlogging, adding videos to your blog posts will result in higher placement on search engines. Do bloggers become successful overnight? No. It takes months, sometimes years, for a blogger to start making good money. Successful bloggers have spent time doing everything listed in this article to make their blog successful. In other words, you can make your blog into a success, it just takes work. This is a wonderful list- it is short & concise. It has always amazed me how many people think that blogging is an easy job, when in fact it is harder than most high management positions. One is basically running a high traffic business, in a field with millions of competitors- and you are fighting to be at the top. Sadly, most don’t make it. Personally, I believe that your 4th point is the most important, yet the most difficult to attain. Everything else seems so easy compared to actually being able to connect with users in a computer world, which is so much easier face to face. I can’t even begin to explain how much time can be involved when you try and connect on ALL the different media platforms, let alone all the knew ones coming out. This is very interesting. I tried a blog once, just to do general postings, and gave up after a couple of weeks. I had no idea how much effort it takes to make quality postings, especially on a regular basis. It is hard work, some blogs are amazing, and they never cease to amaze me! I have been thinking of starting my own blog. This is very helpful, thank you. At one time, I seriously thought I could be a blogger, but then I thought, who am I kidding! I follow a lot of bloggers and read a lot of their reviews!! This is seriously hard work!! I personally don’t know how they find the time with families and all! Plus they give a lot of themselves on their blogs! I feel like I personally know a few of the bloggers. That’s how I feel we connect. I know their children, pets, routines, etc. I feel like I could reciprocate back about my family & situations! I have learned & caught up on a lot of news, events & new products!! I want to thank each and every men and women who take on this everyday task and their giveaways!! I love this! So helpful. As a person who would rather read blogs than write them, I now know how beneficial it is to my business and it doing it right is key. Thanks!